The commands cut through the brisk morning air loud and clear on Friday, Jan. 26, at Tahoe Donner Cross-Country Ski Area. “Left, left, left, good! Now find the track,” called one of hundreds of guides on the course, urging their partners around a track for a race unlike anything else. For most, the sport of cross-country skiing is difficult enough. Years go into the process of mastering technique, and learning the skills needed to quickly climb and descend. Now attempt the process blindfolded, touching ski to snow for the first time, and entering a world where the only notion of direction and surroundings come from the voice of a guide, whose introductions were first met only days prior. This scenario played out for many at Ski for Light’s annual International Week, as more than 250 visually and mobility impaired skiers from nine different countries spent last week at Tahoe Donner learning the ins and outs of cross-country skiing. 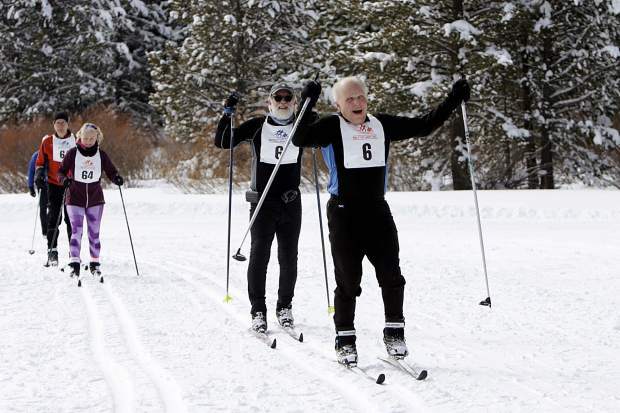 Ski for Light was founded in 1975, according to its website, with the mission to teach visually- and mobility-impaired adults the sport of classic cross-country skiing. Each year the nonprofit organization conducts a weeklong event at a different location, and this year, for the first time, Tahoe Donner was selected as the host site. Many participants and organizers arrived at Tahoe Donner on Friday, Jan. 19, and upon reaching the cross-country ski area, were not optimistic about the amount of snowfall. That snow arrived just in time for the following Friday’s 5-kilometer and 10-kilometer races, matching members of Ski for Light with guides, before setting off into the forest near the cross-country center. Typically, the skiers have the whole week to practice the course before racing, but due to a lack of snowfall, followed by a significant storm midway through the week, the skiers had a limited time on the course before race day. Steady, constant communication with the guide as well as finding good tracks are paramount, according to Bleich, who finished in second place at last year’s Ski for Light International Week. Bleich, who lost his sight around the age of 19, said he’d never skied before becoming part of Ski for Light. He learned to cross-country ski without his sight, and is now among the fastest in the organization. Bleich ended up taking first place by a healthy margin in the 10-kilometer race at Tahoe Donner — the first competition he said he’s ever won at Ski for Light. “There’s this guy from Denmark who’s wicked fast, and he kills us every year, and for some reason he didn’t come this year. It’s a bit of a hollow victory,” joked Bleich. Ski for Light also welcomed mobility impaired skiers to the event, adding another challenge for both guides and participants. Barbara Howie made the trip from Scotland for her eighth Ski for Light International Week. She first participated in 2011 at the Colorado event, where she had her first experience in a sit ski. Now, nearly a decade later, Howie is still making trips over from Scotland to participate. Howie said the sit ski brings its own challenges in racing. The ski can be difficult to stop, often requiring her to drag her poles to reduce speed or have her partner snowplow in front of her. Cornering can be difficult as well with Howie tipping her ski over at one point during the race. Still, she said the sport keeps her coming back, and motivated to stay in shape for the next year. Planning for the weeklong event has taken roughly 10 months, said Tim McCorcle Director-at-Large, with this year bringing in 26 new visually impaired skiers and 20 new guides. “There’s a huge contingent from Houston, and some of them have never seen snow,” McCorcle said. “But they are having the time of their life. Staff writer Justin Scacco can be reached at 530-550-2643 or via email at jscacco@sierrasun.com.